James Johnson, a Long Beach councilman, asked Brown how he intends to figure out the contradiction voters have between their desire to fully fund schools and their hostility to taxes. 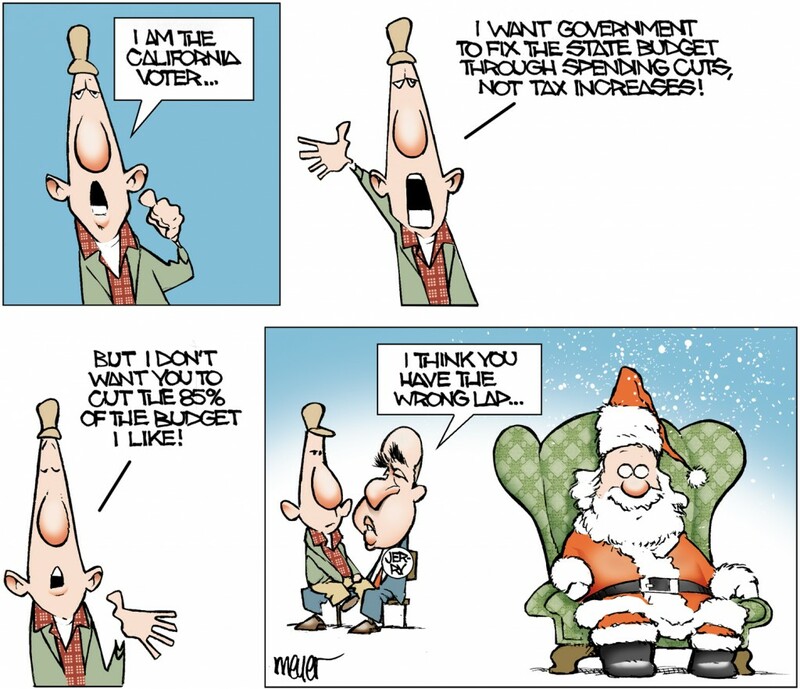 As cuspidated cartoonist Tom Meyer illustrates today, it is precisely this bifurcated attitude of pixie dust magical thinking among Californians that almost-Governor Krusty must confront and disabuse, lest he swiftly disappoint the Golden State populace, and find himself as instantly unpopular and despised as his recent predecessors. 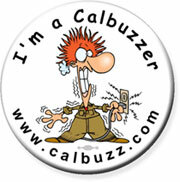 While Calbuzz has eye-glazingly droned about this political phenomenon, it is a point worth repetition and elucidation (as demonstrated with some frequency by the “two Santa Claus theory” propounded by our friends over at Calitics , for example), the better to keep front of mind the electoral landscape that provides such fallow ground for the chronic polarization that afflicts habitues of the Capitol. 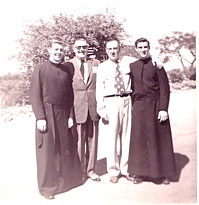 The cardinal responsibility of leadership is to identify the dominant contradiction at each point of the historical process and to work out a central line to resolve it. The audacity of audaciousness: Aging relics that we are, your Calbuzzards confess that we’ve been catching up on our sleep since all the excitement of last month’s election. Nodding off at nappytime must have been the reason we missed the extraordinary news that Kamala Harris had been elected Queen of All She Surveys at some point over the last couple weeks. What else could explain the overweening self-importance, pompous pretentiousness and garden variety delusions of grandeur that led Ms. Attorney General-elect to summon the state’s press corps to announce with trumpets blaring – Make Way, Make Way for the Empress of River City! – her “Transition Leadership Team,” a bloated and overblown engine of hot air and fecklessness festooned with gobbledegook about “best and brightest minds,” not to mention 11 – eleven, count ‘em, eleven – sub-committees and the enlisted services of Warren Christopher and George Shultz, California’s greatest living symbols of political decrepitude. Transition to what? Give us a break. 1-Queen Kamala is stumbling into office on the weakness strength of a thoroughly underwhelming victory of 46.1-45.3% over L.A. DA Steve Cooley, a miniscule edge, eked out only after weeks of vote counting, which ain’t exactly what you like to call your sweeping mandate. 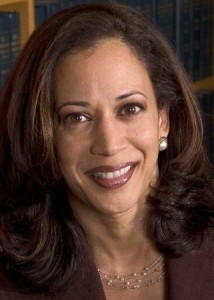 2-Landslide Harris clearly benefited from incumbent AG Brown’s coattails (or Meg Whitman’s undertow, depending on how you look at it) yet presumes to insult and trash by implication his stewardship of the office, declaring that now that SHE’s here, we can finally be about the work of deciding “how to fix the state’s broken criminal justice system,” as she modestly put it in her big announcement. 3-The new AG’s framing of her ascension as the Long-Awaited Arrival of the One is in sharp contrast to both Brown and Lite Gov-elect Gavin Newsom, who so far have handled their transitions in a low-key, no-frills way (despite following incumbents of the other party) more befitting, you know, a routine transfer of political power after an election. 5-The newbie top cop (not to mention the rest of us) would be better served by her spending at least a little time scouting out the bathrooms before leading us all into a golden age of law enforcement nirvana. Much of Harris’s grandstanding, of course, likely has less to do with the operations of the AG’s office than with her wasting no time beginning to position herself for a future governor’s race. No matter how many pull-ups the 72-year old Krusty can do, younger ambitious Democrats (see: Villaraigosa, A.and Newsom, G.) can’t help but calculate the odds he’ll be a one-term governor and nobody wants to be left at the starting gate. Why April 11, 1954 was the most boring day in history. You probably won’t be surprised to learn what America’s most annoying word is. Terrific yarn from Neon Tommy about the guy who took the iconic picture of the Kent State massacre. Amid all the chatter about Brown eyeing a special election, Timm Herdt seems to be the only one (besides Big Dan Walters Himself) who bothered to look at the calendar. Both Peggy Noonan and Michael Gerson have excellent takedowns on the shabby way Obama handled the tax deal. At least Krusty’s not alone. Despite his annual struggle against Seasonal Affect Disorder, Calbuzz staff psychiatrist Dr. P. J. Hackenflack has bravely battled his way through the stacks of mail that have piled up since the election, and graciously agreed to return today to answer our readers’ burning psycho-political questions. Now that the election’s over, is Meg Whitman feeling any regrets about the way she treated her housekeeper, Nicky Diaz? Totally. She can’t find anyone to clean the kitchen or do the wash, let alone bring in the mail. I’ve noticed that Los Angeles Mayor Antonio Villaraigosa all of a sudden is traveling around the country trying to raise his profile. Wussup with that? Ignore the political speculation. Just happens Tony V’s run through all the female anchors in L.A. and feels ready to move up to network news babes. Why is Dianne Feinstein running for another term at her age? I’ve seen younger faces on cash. She’s determined to pass Strom Thurmond on the all-time Senate geezer list. A friend said Jerry Brown is going to make his wife his chief of staff in the governor’s office. Do you think that’s a good idea? Yo Jacques – the doc is still trying to finagle invites to the big inaugural parties, so no way I’m touchin’ that one, dude. One of the Hollywood blogs said Arnold Schwarzenegger is in line to play the lead in a remake of “Mr. Smith Goes to Washington.” True? I saw on the news that Senate Republican leader Bob Dutton sat in the audience instead of onstage at Jerry Brown’s first public hearing on the budget. Do you think that was an effective protest? Ana Matosantos seems like a nice, smart person, but it seems strange that Jerry’s keeping on Arnold’s finance director. Can you shed any light? Turns out Governor Gandalf was time traveling when he met her and thinks he’s rehired Adriana Gianturco. Now that San Francisco’s mayor’s been elected lieutenant governor, there’s a big fight to replace him. Who’s the best candidate? – W. Brown Mineola, Tex. Clearly Gavin Newsom. He has absolutely nothing else to do for the next four years. Reflecting on his first incarnation as California governor, Jerry Brown says he was overly concerned with the importance of new ideas and not focused enough on the practicalities of getting things done. In the first extensive interview about his 2010 gubernatorial bid, Brown told Calbuzz that if he wins back, at the age of 72, the office he first captured when he was 36, things will be different. Speaking in rushing streams of high-speed sentences, Brown talked of everything from how to attack Sacramento’s partisan dysfunction to the hair products used by Democratic rival Gavin Newsom. Boasting that his two terms as governor were “good years” for California, he rattled off a list of accomplishments, while uncharacteristically acknowledging some shortcomings. “My sense of management has been refined and developed,” said the man who, as governor, was known to mock and belittle the pathways, processes and procedures of state government and those who work in it. 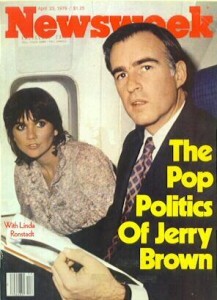 His candidacy still formally undeclared, Brown only occasionally used the phrase “if I run,” in portraying himself as a master politician whose experience in elected office at every level – mayor, attorney general, state party chairman, to name a few – affords him unmatched understanding of government organization and operations which he would wield at California’s intractable problems. We wanted to interview Brown to ask his views on seven key questions we posed to all the candidates in one of our first posts. In his own fashion, he addressed most of them. 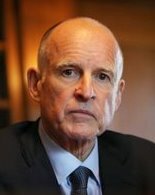 However, Brown staunchly refused to specify what combination of cuts and tax hikes he would support to deal with chronic deficits, beyond stressing his view that California is a “very high tax” state and dismissing as politically impractical the proposal to amend Proposition 13 by taxing commercial and industrial property at higher rates than residential property. How would he deal with fiercely ideological legislators on the left and the right? We asked Brown this key question: What do you want to do as governor? He quickly ticked off four key concerns with specific ideas in each area: Renewable energy; prison reform; education reform; water policy (we’ll report details on these in future posts). He acknowledged that pushing through innovative solutions on these issues would be difficult in the polarized atmosphere of Sacramento. 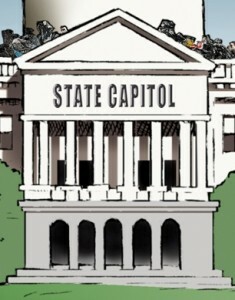 He labeled as “a type of anarchy” the view of some GOP lawmakers that sending the state into bankruptcy is preferable to voting for a budget that includes tax increases. “That kind of subversive attitude is unacceptable,” Brown said. Asked about structural reforms, Brown said he doesn’t “think term limits have been helpful” because they create a revolving door mentality, with lawmakers constantly running for the next office. While not a fan of the two-thirds majority vote needed to pass budgets, Brown said he doesn’t think there is a “mechanical” cure to structural financial problems. Sounding most unlike an old-school Jerry Brown Democrat, he argued repeatedly that regulations making California less competitive than surrounding states must be challenged. “We have to make sure that regulation does not curtail business,” he said, echoing the Chamber of Commerce more than the Sierra Club. Informed that he’s older than the ballpoint pen, Brown laughed. 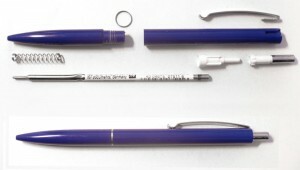 “I remember the ballpoint pen,” he said, recalling that when the instrument came out, it was available to students only in blue ink (and it leaked). Ho, ho, ho: Just because we can’t resist pictures of dogs in goofy costumes. Gov.-elect Jerry Brown’s Budget Teach-In last week in Sacramento was refreshing in its openness — with Brown and other presenters warning that the state’s budget shortfall is now estimated at about $28 billion between now and July 2012. No smoke. No mirrors. Just cold ugly facts. But the gathering at Memorial Auditorium only took about 12 seconds to demonstrate anew that the fundamental conflict in Sacramento will not be solved by gathering everyone in a room together, sitting around the fireplace and singing kumbaya. Collegiality and civility certainly have been in short supply among the locusts fine men and women California voters have sent to the capital on their behalf. But the principal contradiction is not a matter of congeniality — it remains political and ideological. Most of the Democrats, and all of their leaders, believe the state’s budget shortfall is a revenue problem. They think taxes aren’t properly distributed and that solutions will be found by increasing revenues. Most of the Republicans, and all of their leaders, believe the state’s budget shortfall is a spending problem. They think cutting unnecessary and overly generous state spending is the road to salvation. Republican Gov. Arnold Schwarzenegger did no better — and some would argue a lot worse — than his Democratic predecessor, Gray Davis, at placing California on a firm financial footing. As he skips town, he leaves behind a huge mess that former-and-future Gov. Brown now must try to clean up. 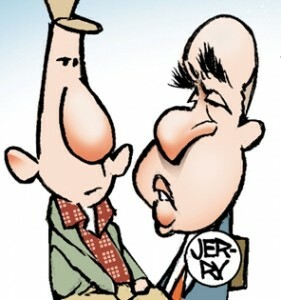 Rumors abound that Jerry is planning to craft an austere budget which he will use as Exhibit A to obtain from voters some sort of temporary tax increase in June, or perhaps even a measure granting voters in cities, counties and school districts the authority to raise taxes with a majority vote or at least something less than two-thirds. That would certainly return decision-making to local communities, “closer to the people” as he said in his campaign commercials. This of course could only succeed if Republicans and conservatives did not wage war against it. Which brings us back to the principal contradiction, which is a matter of ideology not civility. 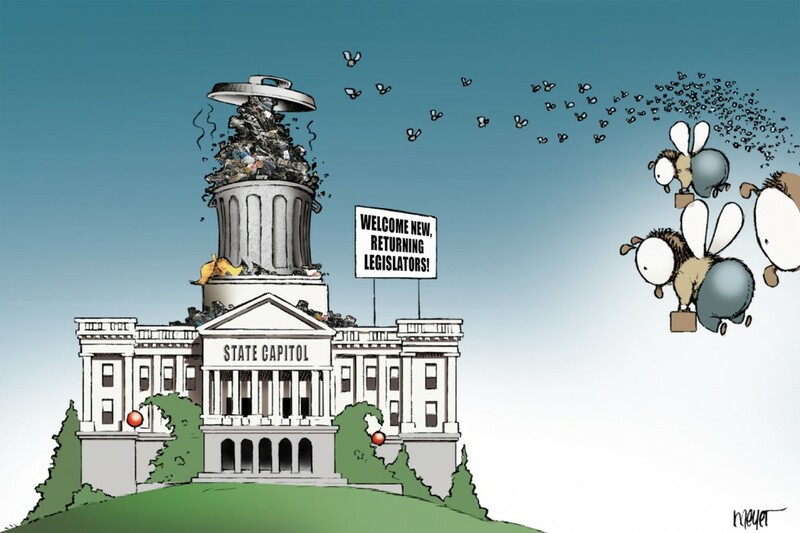 To a cartoonist, like our Tom Meyer, it’s all a huge pile of garbage that’s been left behind by the previous administration and Legislature. It’s hard to argue with that. What does Tony V want (don’t ask the LAT): Not since M.C. 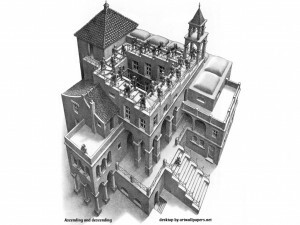 Escher has there been such a perfect image of bizarre and inescapable bureaucracy as the By God Los Angeles Times displayed over the past week in its mishandling of an important political story involving hometown mayor Tony Villaraigosa. Villaraigosa was in Sacramento on Tuesday to deliver the opening speech of the big conference on the state’s future sponsored by the Public Policy Institute of California, which drew about 600 political and policy types, including the likes of such national names as Judy Woodruff, Van Jones and Dan Balz of the Washpost. What is stopping us from changing direction? Why, for so long, have we allowed denial and indifference to defeat action? I do not raise this question lightly, and I do not come to my conclusion from a lack of experience. I was a legislative advocate for the California Teachers Association, and I was a union organizer for United Teachers of Los Angeles. From the time I entered the California State Assembly and became Speaker, to my tenure as Mayor of Los Angeles, I have fought to fund and reform California’s public schools. Over the past five years, while partnering with students, parents and non-profits, business groups, higher education, charter organizations, school district leadership, elected board members and teachers, there has been one, unwavering roadblock to reform: UTLA union leadership. While not the biggest problem facing our schools, they have consistently been the most powerful defenders of the status quo…Regrettably, they have yet to join us as we have forged ahead with a reform agenda. Tony V’s deliberately provocative comments, coming from California’s most prominent Latino politician, not to mention a lifelong union goon, were a big deal, voiced at a time when teacher unions are increasingly embattled by national education reform efforts, starting in the White House. And that’s how the matter was treated – by almost everyone except Hizzoner’s hometown paper. Within minutes, David Sanchez, president of the California Teachers Association, had fired back at the mayor during a panel discussion that followed his speech. The relentless Jack Chang filed a post about the conflict on the Bee’s Capitol Alert blog not long after, as did the invaluable John Fensterwald on his state education blog . 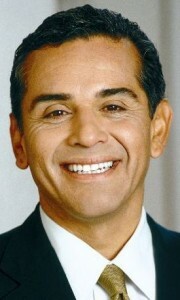 By the next morning the reform-minded Joe Mathews had characterized Villaraigosa’s remarks as “the most significant speech given by a California politician this year,” and a variety of broadcast and wire reports, along with several newspaper editorials strongly supporting the mayor’s sentiments, were circulating. And amid all the urgent buzz over the next two days, the L.A. Times produced . . . radio silence. 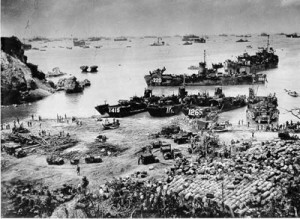 Not a word from any beat, anywhere on its far-flung editorial depth chart, which is rivaled only by the forces that gathered for the invasion of Normandy for organizational complexity and resources. Our motto: if it’s news, it’s news to us. Finally, on Friday morning, Times editors managed to clue their readers into what their mayor had been up to that week. A double byline story by Patrick McDonnell, who writes about labor, and City Hall reporter David Zahniser, which also included reporting by Teresa Watanabe and Jason Song of the education desk, finally caught up with the news – a full 72 hours after Villaraigosa spoke. “I knew it would cause a firestorm,” Villaraigosa said in an interview Thursday, two days after the speech. 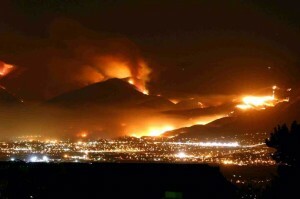 This just in: Big firestorm slowly heading toward L.A. In the end, it was left to Cathy Decker, the paper’s ever reliable state politics editor, to clean up the elephantine mess with a Sunday thumbsucker that addressed the key question puzzling Calbuzz readers: WTF is Tony V up to? “For a Democratic politician who is presumed to have ambitions once he is termed out of office in 2013, Villaraigosa’s moves were intriguing,” Decker wrote. To those more Machiavellian in nature — say, the entire political establishment — other possibilities came to mind: Villaraigosa was angling for an Obama administration job. He was declaring independence from party positions and powers in preparation for a future statewide run. Or he was trying to redefine his mayoralty in a way that could reap benefits down the line, were he to decide to exercise options one or two…. Part of the difficulty in divining what Villaraigosa was trying to accomplish last week is the parallel difficulty in figuring out where he might be going. When he first ran for mayor in 2001, Villaraigosa was seen as one of the Democratic Party’s up-and-comers. Now the senior Democrats — Sens. Dianne Feinstein and Barbara Boxer and Gov.-elect Jerry Brown — are in their 70s. Villaraigosa will be pushing 60 when the next big race occurs — Feinstein’s Senate seat is up in 2012, though she has said she plans to run again. Catching up with the mayor is a younger group of Democrats, personified by the incoming lieutenant governor and attorney general, Gavin Newsom and Kamala Harris. Both are in their 40s. For upward momentum, or just a legacy, Villaraigosa has to make good on his basic pledges: to lower crime, improve schools and increase jobs. Crime has been down, but joblessness is high. Voters can cut mayors slack during national downturns, but no such slack is likely w hen it comes to the state of the schools. Villaraigosa himself said years ago that voters should “absolutely” hold him responsible for reforming schools, and unless he can convince voters that the unions are to blame, they are likely to hold him to it. Today’s sign the end of civilization is near: Remind us again why she gets to be on “Meet the Press”?